Photo of Nairo Quintana by the A.S.O. On the second rest day of the Vuelta a España, Nairo Quintana pointed out to his plan for the last week of racing, as well as key moments of these past days in the race. A week ago, Quintana trusted that by the second rest day he was going to be wearing the Red Jersey, but things haven't gone his way. "Sometimes, what you wish -in our case, getting to the race lead before the TT- isn’t what ends up happening," he commented. "The fact that we’re so well matched against each other has played a big part in how the race has unfolded so far. "We’re coming here after a very tough Tour de France, while some of our rivals have got the chance to prepare themselves well after racing the Giro; both of them (Yates and López) with huge protagonism. Also from the Giro came Richard Carapaz, who has come to this race fresh and strong, and helped us a lot during the last two weeks. The important thing for us is that we remain up there in contention. The gaps should be more defined after Tuesday’s TT." 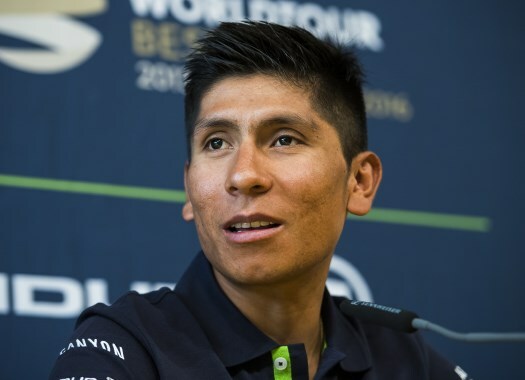 The Colombian hasn't been able to contest for bonuses or stage wins in the race so far. "We’ve basically lost time just on bonus seconds, which I don’t like to happen," Quintana explained. "That equal strength from all main contenders has been the key for some of our rivals putting time on us based on those bonuses. "I hope I can avoid that situation repeating itself in what’s remaining of this race, and together with Alejandro, pay more attention to those finishes. On the other hand, Alejandro should be the man doing the best TT performance of all main contenders, and he’ll surely take advantage. After that, we’ll see how things stand before the final mountains, and how I’m feeling." His teammate Alejandro Valverde sits in the second position of the General Classification, at 26 seconds from Simon Yates and that can put the leadership of Movistar on different shoulders. "If I’ve got to work for Alejandro, I’ll do, that’s clear. Also, we’ll have a strong advantage by our side in the most difficult moments of those three mountain stages, which is Richard Carapaz, a man we must keep taking care of. Hopefully, we’ll once again enjoy his support in the final week. "Alejandro and I have always get on well with each other, and if there’s a case of me having to work for him, it wouldn’t be the first time. The friendship we’ve forged for the last seven years has made our team stronger and has also made each other stronger. What he said is true: the only important thing is winning the Vuelta for Movistar. There’s the TT left, there are three mountain stages left, a windy stage towards Lleida. We don’t know what will happen, but the positive thing for us is that we’re still up there, and we’ve got strong legs."